I love summertime when fruit is sweet and delicious. We’re lucky in Florida to have two strawberry growing seasons, and having Plant City strawberries in late winter is a treat! An easy topping for ice cream or custard is Macerated Strawberries. I use this in trifles and Strawberry Cream Pie. The method can be used for any fruits you like, in any season. Using fresh fruit is best, but I’ve used frozen when I can’t get it in season. If I use frozen fruit, I let it thaw while it’s macerating. Wash and hull the strawberries just before macerating them. Cut into bite-sized pieces. Combine all ingredients in a plastic container. Refrigerate, stirring occasionally. If you don’t like Grand Marnier, substitute anything or nothing. The sugar will help break down the fruit. I’ve used Prosecco, white wine, and other spirits – whatever I have on hand. This keeps for days, although we usually eat it up within a couple of days. I’ve used the liquid to spoon into parfaits after the fruit is gone. I don’t waste any part of this! You can macerate any fruit. 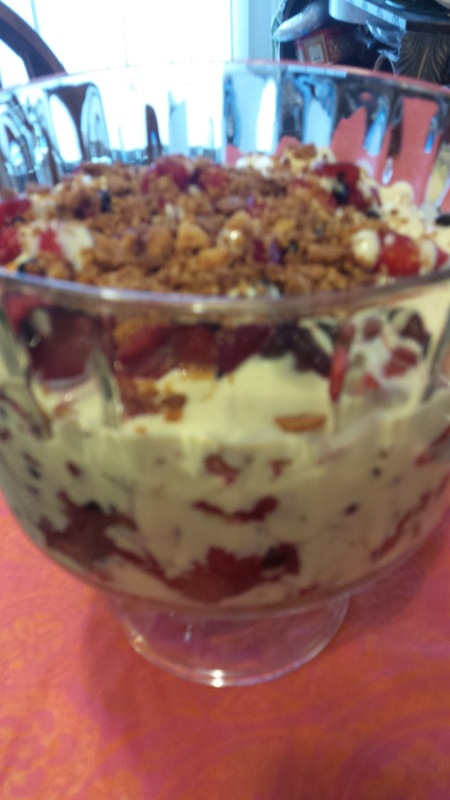 I’ve used blueberries, raspberries, and strawberries to make a Three-Berry Trifle (pictured here). Enjoy fruit at the peak of its freshness, or macerate frozen fruit to give it great flavor.